IMAGE: A bus and bicycle only street in the city of Utrecht. Making space for cycling is mainly a matter of the politics of space. We are inviting Irish politicians to join us on a Dutch cycling study tour to Utrecht, our tour is aimed to be low-cost but still wide-ranging. Please contact cian.ginty@gmail.com for the details. Our last Dutch study tour in 2015 included a mix of councillors, civil servants, consultants and campaigners, and we’re aiming for a similar mix this year. Even if you have visited the Netherlands before, going on a cycle study tour with Dutch experts on hand is a completely different experience. It’s about doing so in an informed way and visiting different design examples usable in different contexts in Ireland. 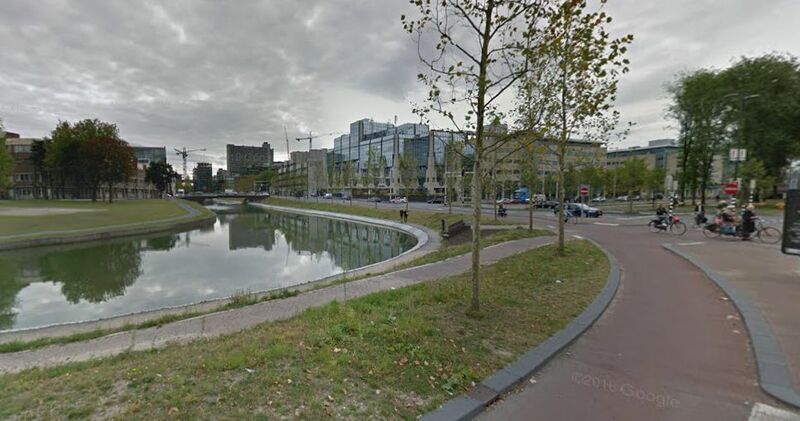 For example, context like “this was 5 lanes now it’s bus/bike only” (as in the case of the main image above) or this used to be a motorway-like junction and now a canal was reintroduce (see the before and after images below). The details are vital and we’ll be looking at examples of Dutch cycle paths, high-capacity train and city centre bicycle parking, a bicycle parking guidance system, cycling-friendly housing estates, bicycle bridges and much more. “I have never felt as relaxed and happy cycling” – Barbara Connolly, Cycling Standard Development Officer, Cycling Ireland. “The freedom and ease to simply cycle where you need to go” – Keith Byrne, former chairman of the Dublin Cycling Campaign. “The infrastructure was there to make cycling as safe and pleasant as possible” – Phil Skelton, Stayin’ Alive at 1.5 campaign. If you get the chance see the new train station in Delft which has a beautiful, indoor, ride-in bicycle store for 5,000 bikes with electronic stand inictators, ticket machines for trains and electronic boards for train times. The store connects directly to the platforms below ground. State of the art and spotless. We visited the first new unit of 4,500 spaces in 2015, and will be visiting it or a partly opened newer unit in August. I think this is a good idea but you should try to get the same politicians to take a tour of the infrastructure in Ireland afterwards. Most of them probably don’t understand how poor what we have is. Do they even realise how scrappy and unconnected our lanes are. How often you lose priority needlessly. How often you are forced to go down a side road and use a pedestrian crossing to go straight ahead. How often you can’t easily make a right turn. Ideally the same Dutch expert would be on hand to tell them how unacceptable a lot of our facilities would be in the Netherlands, and what specifically we should change. Cian……yet again a wonderful initiative that can help to increase knowledge and understanding of the potential impact of good infrastructure on the ‘ambience’ and functionality of a city/town. I would urge both local and national politicians to sign up and get first hand experience of the possible future for Irish towns and cities! Im emigrating to Utrecht last weekend in August, would love to join for a cycle!